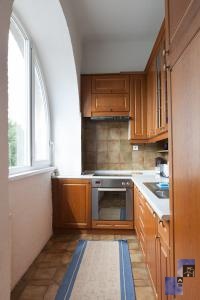 This functional apartment is located in the center of Ljubljana on Tivolska street, on the 1st floor of traditional building from 19th century near the five star Hotel Lev. There is about 800 m to the main square in the historical centre and just a step away from park Tivoli. Vicinity of the main bus and railway station makes it an excellent base when exploring Ljubljana and its surroundings. The bright apartment has 3 bedrooms, one with two twin beds, sofa which falls down to a bed, two writing desks, computer and wardrobes, another one with two single beds, 2 writing desks computer and wardrobes and the third bedroom with a single bed and wardrobes. In the living room there is a sofa, LCD TV and dining table for 6 persons. 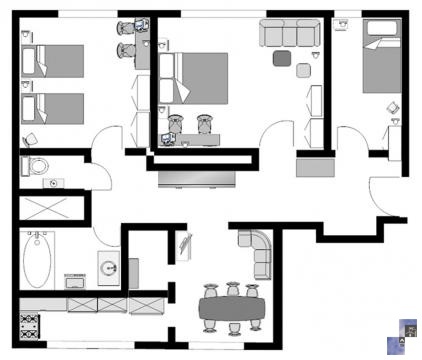 The kitchen is fully equipped with cooking utensils, stove, oven and refrigerator with freezer. 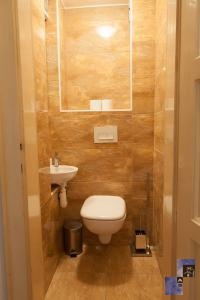 In the bathroom there is a bath tub, washing machine and a sink. The toilet is separated. Apartment is equipped with iron along with ironing board, hair dryer, telephone, CATV and free broadband wired and wireless (Wi-Fi) internet access. Towels and linen are provided. Payable parking is approx. 150 m away from the apartment.